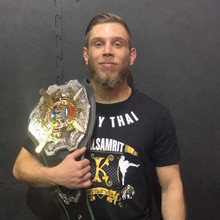 Nicolas has been training martial arts for over 10 years and has competed in multiple disciplines including Goju Ryu Karate, Brazilian Jiu-Jitsu, Muay Thai, Boxing and MMA. Nicolas is a kids & adult instructor and Actively competing in MMA towards a professional career. Black belt and compete in over 30 competitions. Blue belt and competed in over 20 competitions.